PeachDish is a brand new company, led by CEO and Founder Hadi Irvani, that wants to help making cooking easier and more fun for you! 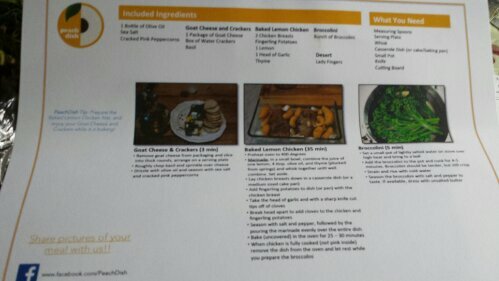 For only $20 per week/shipment, they send you the ingredients and recipes to create a 3-course-meal for 2 people! Yeah, for only $20! Many other companies start at $40 per meal, if not more, and usually come with just one or two main courses. Since PeachDish is a new company, they only offer one option at the moment: a surprise 3-course-meal, shipped once per month. However, as they have plans to expand, they will begin to allow you to customize your order (perhaps choose 1 out of 3 options, or something along those lines). They ship out of Tuesdays, so they generally arrive on Wednesday or Thursday, all ready for you to start cooking! Plus, if you’re out of town, you can delay your shipping so it doesn’t arrive and rot on your doorstep, and you can cancel anytime. Or, if you need to prep for 4 people, they offer a larger version for only $40 per shipment…. At $10 per person, this really is awesome. So now, onto the box and the food! My FAVORITE part of the delivery was that my box was labeled to “Princess Mackenzie Degen”, I had no idea it would be coming that way, and definitely made my mailman laugh, but it was a very clever addition and I like the royal mention. You can see they put a ‘cooling case’ inside the brown box to try to keep the food as fresh as possible. I was a little worried about the chicken, as the ice packs sent with it were completely soft and warm, however it was still in good condition. I recommend to anyone expecting a delivery to make sure someone is home at your house/delivery location, because if the box sat until I got home from work, it could have cooked in the heat for a few hours. Everything else seemed to be in good condition- the lemons, basil and thyme all fresh, the goat cheese, olive oil and other packages sealed, crackers all in one piece, and cute packaging for the fingerling potatoes! The broccolini was a tad yellower than I’m used to, however it didn’t taste different than normal after cooking it. I laid out all the ingredients so that you can see everything they sent, from packaged raw chicken, fresh potatoes and broccolini to fresh herbs, packaged spices. They thought of everything, so you don’t even need to use your own olive oil or salt. Prepping was pretty easy: the chicken was almost fully cleaned, I just gave it a rinse and cut off a few small fatty bits (I’m just picky) and then worked on the marinade. I squeezed the fresh lemons and combined them with the designated olive oil and thyme. I normally eyeball measurements, but for this review I tried to stick to the guidelines! I then laid out the chicken and fingerling potatoes in a glass-baking dish, covered them in the marinade and put almost a whole bulb-worth of garlic (included) on them. Then, I added some salt and pepper as encouraged, and popped it into the oven to start cooking while I set up the other dishes! I laid out the crackers on a dish, and tried to cut up the goat cheese into slices to put onto it. As many of you know, goat cheese has a super creamy, soft texture, so I ended up spreading most of it onto the crackers. Then I topped with chopped fresh basil, a dash of sea salt and the red peppercorns, and drizzled the olive oil over the top. After taste testing, I definitely say that the basil and olive oil are a great addition, but the sea salt was definitely unnecessary. I would, instead, add the rough salt to the chicken and potato’s, or save for the broccolini. As with the peppercorns, I think if they were crushed up, they might be better than whole, and as a personal preference, I would add them to one of the other dishes. I had a few of the crackers as designated, and then updated them ‘my way.’ That means, I rolled half of the peppercorns off, added sliced fresh peaches on top and drizzled with a bit of honey and balsamic vinegar. Yum! Then, I put a pot of water on to boil the broccolini in while the chicken continued to cook. I seasoned it with a dash of salt, and let it come to a boil. Then I added the fresh broccolini to the water and let it cook for about 5 minutes, and drained it. While it tasted good and would have been a ‘healthy choice’, I decided to give it a little more pizazz BY USING ONLY THE INGREDIENTS I WAS GIVEN. I heated up a small pan with some of the leftover olive oil and threw a few of the fresh garlic cloves to cook and soften up/brown, and then added the broccolini with a touch of salt and pepper to cook for just about 2 minutes. Delicious. Finally, the chicken and potatoes were ready to come out! The chicken was cooked perfectly, and the potatoes just starting to break open, meaning they would be soft and delicious. I added a half of a chicken breast, a few fingerling potatoes and the broccolini to my plate and dove in for the official taste testing. The chicken, while cooked well needed an extra something… either some hot pepper flakes, more herbs or a dry seasoning rub. It was like a mellow lemon-oil chicken flavor. I think if the garlic cloves were crushed up and the chicken marinade for 30 minutes, it would probably soak in that flavor. The potatoes, in my opinion were perfect. For an extra ‘oomph’ you can add a little extra oil or butter to the potatoes once you cut into them. All in all, PeachDish definitely is a great concept and included more than enough food for two people. Some constructive critisicm I have it that I think they need a dash more flavor/spices/herbs included in their recipes, and maybe revamp the recipes or change a few things up. I think because my entrée was so savory, I wanted something sweet or refreshing to start/finish with, which is why I added the peaches and honey to the goat cheese appetizer. A plus in my book was that they threw in 3 Lady Finger cookies, which I was not at all expecting. 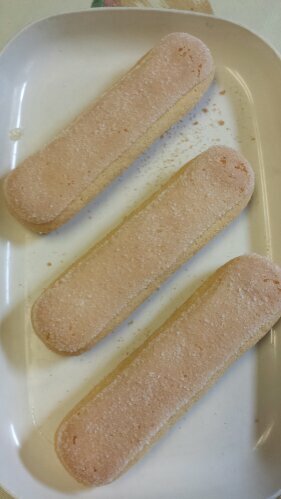 They were yummy as is, but would be even better if they added a packet of ground coffee (enough for 2 people) to brew and serve with them, or a chocolate sauce or mascarpone/ricotta to spread on like a DIY Tiramisu. I mentioned PeachDish to a few friends who loved the idea and overall concept (and oooh-ed and ahhh-ed at my pictures) however a few of them are vegetarians. I would love for them to come up with an option to choose a meatless meal if possible, so that I would invite one of them over for dinner and have everything I need accessible to cook for both of us! Interested in trying PeachDish? I know I definitely want to again…. Sign up HERE!